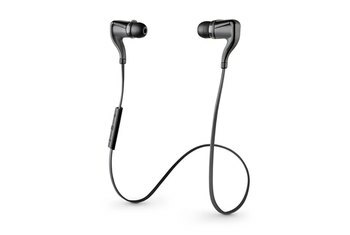 These headphones provide excellent audio quality with booming sound. 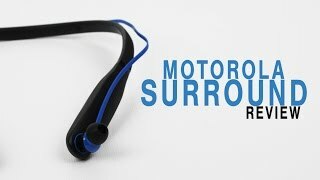 The Moto Surround has a connectivity range of up to 150 feet. 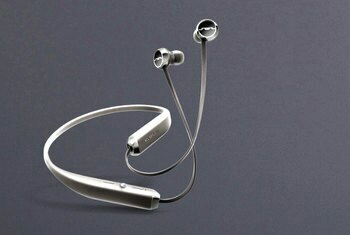 The collar lets you access all the playback and call options, while keeping the buds magnetically in place when not in use. 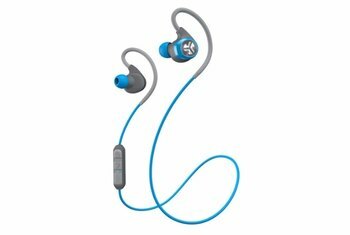 Some users struggled to keep these earbuds in place in their ears. An annoying low-battery warning mars the last 30 minutes of listening. Background fuzz with a static-like sound is present in everything you listen to and is especially noticeable in spoken word recordings. 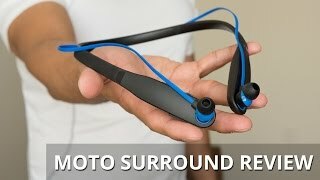 Motorola's Moto Surround Bluetooth headphones are targeted to fitness fanatics and listeners on the go. 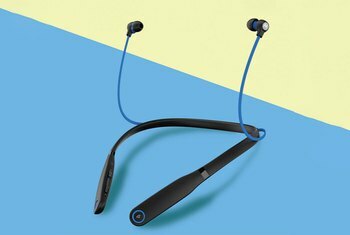 While the Moto Surround's release accompanied the company's Moto X and Moto G smartphones, these waterproof, sweat-proof headphones work with any smartphone. 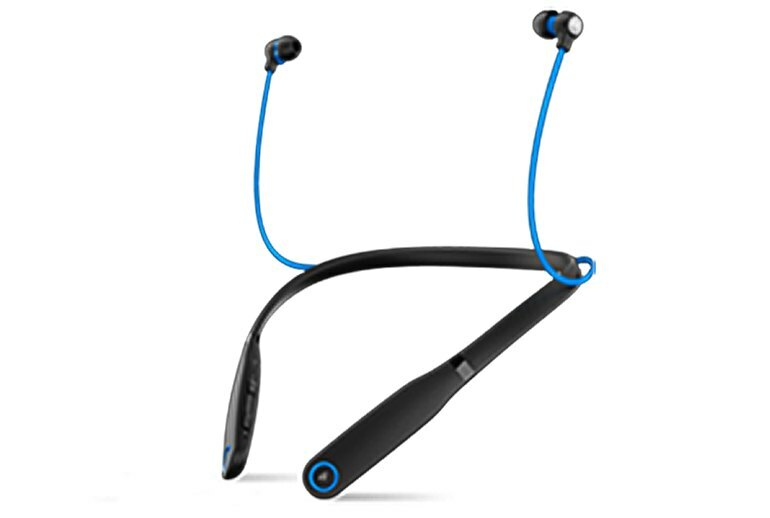 Moderately priced but with advanced features and dedicated control buttons, the sporty-looking, around-the-neck accessory offers HD audio for pleasing musical playback. 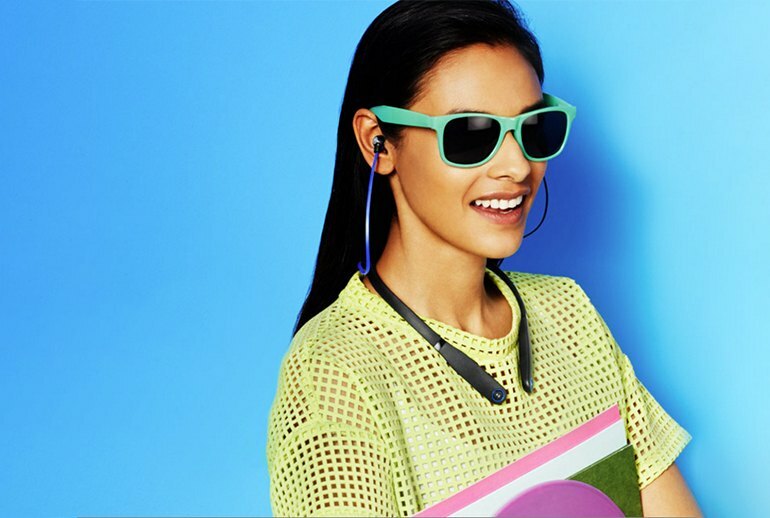 The built-in mic and talk button facilitates easy phone calls, while Motorola claims a wireless range of 150 feet. Battery life should last about 12 hours for any kind of use. A dedicated app allows for easy pairing and lets you find misplaced buds or check battery levels. I could hear each instrument clearly during music, with distinct highs and lows. I found mids to struggle a little, but I think that had more to do with them being earphones than poor sound quality. The main design feature is a black plastic band that wraps around the back of the neck and rests gently above the chest. Its outside edge is peppered with matte and glossy plastic textures and rubber, which altogether give it a spiffy look. 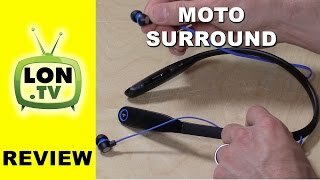 Relying on a very up-to-date Bluetooth 4.1 connection, we’re most astounded by the Moto Surround’s extra-long connectivity range. The company claims that its range can go up to 150 feet, which is an incredible claim on its own, but in our real-world experience, we’re more impressed that there’s no degradation or loss of connectivity when using it indoors between 50 to 75 feet – and that’s through walls too! I’m not a big fan of the build or design in this case, but I have to admit that they are durable. The hard plastic of the neck piece feels brittle but is actually quite flexible. 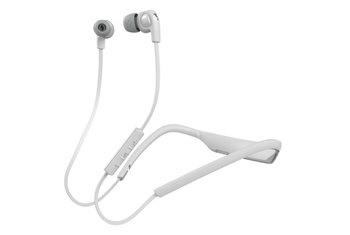 It has a rubberized grip on the back so you can get a better hold on it and magnets on both ends allow you to attach the earbuds to them when not in use. The Surround’s main design merit is its relative simplicity: The buds are just like what you’re used to if you use in-ear headphones, while the Bluetooth electronics, battery, and controls are in the little plastic arc that you wear like a future collar. That low battery warning continued for two hours, but increased in frequency during the last 30 minutes and made listening to anything essentially pointless.